Prime Time Sports Talk | What Version of Chris Sale Will 2019 Bring? What Version of Chris Sale Will 2019 Bring? In two years since being traded to the Boston Red Sox, something has been missing from the Chris Sale experience. It feels weird to say that, considering he’s been one of the best pitchers in baseball, as well as a World Series champion during his brief tenure in Boston. What he’s missing can be summed up in just one word: Consistency. There’s been a noticeable trend in Chris Sale’s game over his Red Sox career. Start well, heat up as the weather gets warmer, then either get injured or fade off in the second half of the season. Let’s take a look at Chris Sale’s splits over the past two years in the first half, compared to the second half. While those “drop-offs” aren’t technically staggering, there are definitely some signs that Chris Sale is a different pitcher after the All-Star Break. For starters, in 2017 Chris Sale’s ERA jumped almost 0.4 runs, his opponent’s OPS went almost 100 points higher, and his walk rate went up 1.5 percent. Then move on to 2018, where across the board Sale’s numbers are dominant. However, he only pitched 29 innings in a second half that featured two injured list stints, and a postseason where he was just good enough. The average velocity on Sale’s fastball also dipped from 97.4 mph on July 27 to 90.1 in his final start of the regular season on Sept. 26. Even with the media speculation around him, Sale didn’t need surgery in the offseason and appears to be raring to go for 2019. 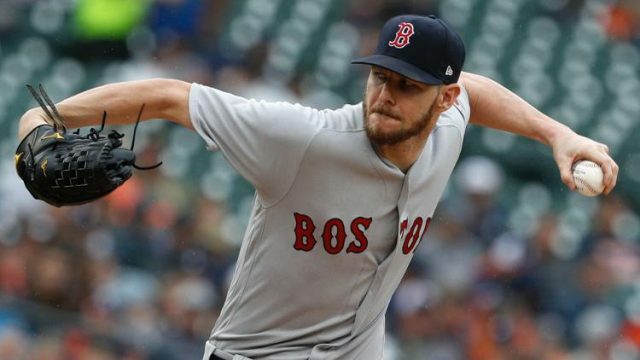 Which version of Chris Sale will the Red Sox be getting in 2019? For a guy who notoriously falls off in September (3.78 ERA), Sale has a track record that is hard to bet against repeating. That being said, the same could’ve been said about David Price in the postseason last year. The only way for people to truly believe he could figure it out was by showing he was capable of doing so. Same goes for Sale in the second half of the season. Sale needs to have strong, healthy first and second half of the season to all but lock himself as a frontrunner for the American League Cy Young Award.